This idea becomes particularly fraught when we’re talking about where I live: the occupied West Bank. My hometown, Hebron, has been under Israeli military occupation since 1967, more than a decade before I was born. I have never known freedom or equality in my homeland, and, over the years, things have gotten worse. Today, Israeli settlements are scattered all over occupied Palestinian land in the West Bank, including in and around Hebron. Settlements, which are illegal under international law, are widely considered one of the biggest roadblocks to a lasting peace. 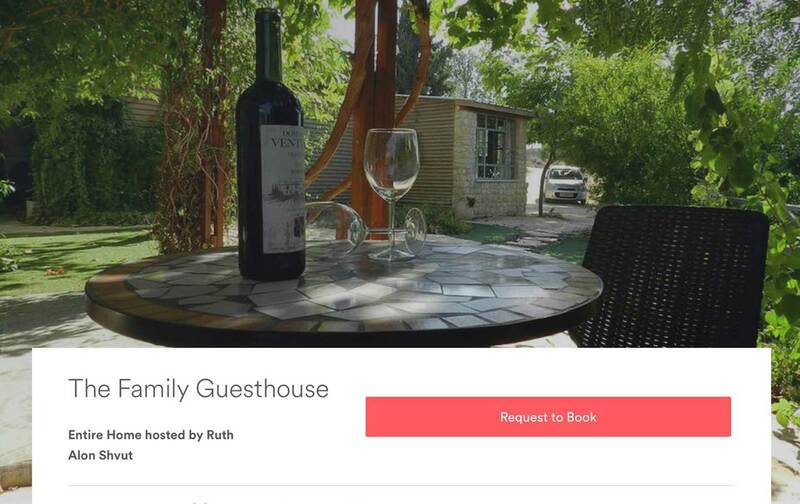 All these listings fall outside the Green Line (used to delineate the internationally recognized border between Israel and the West Bank), but they are listed as being in “Israel.” In fact, Airbnb’s maps do not draw attention to the Green Line, making it difficult for the unfamiliar user to distinguish. Guests may not even realize they are actually staying in a settlement until they see the checkpoints and segregated roads. Recently, Airbnb came under scrutiny for complaints of racial bias on its platform, and CEO Brian Chesky tweeted that “Racism and discrimination have no place on Airbnb.” Despite this, and even though Airbnb’s anti-discrimination policy states that the company prohibits listings that promote racism, discrimination, or harm to individuals or groups, “Haled” faced blatant discrimination. Moreover, Israeli settlements are discriminatory by their very nature: Palestinians who are indigenous to the land not allowed to live in them. And those that live under Israeli rule, whether under a brutal military occupation in the West Bank, Gaza, and East Jerusalem, or as second-class citizens within Israel, face apartheid policies. I am no exception. When I was a young child my father would hold my hand as he would take me through the busy marketplace of Shuhada Street. That was before Baruch Goldstein, an Israeli Jewish settler from Brooklyn, opened fire in the Ibrahimi mosque in 1994, killing 29 people in prayer. Since then Shuhada Street has been almost entirely closed to Palestinians, and the doors to Palestinian homes sealed shut under order of the Israeli military. These restrictions have forced thousands of Palestinians to leave their homes, and more than 1,800 businesses have been forced to close. But international law is clear. Human-rights organizations have made it clear. And to Palestinians who recently marked 68 years since the Nakba, the deliberate and systematic mass expulsion of Palestinians from our land to establish the state of Israel in 1948, it is not at all complex: Millions of us are unable to live in our homeland freely; until we are, companies shouldn’t profit from others going there. Issa AmroIssa Amro is coordinator of Youth Against Settlements.